At one of my very first magazine jobs at U.S. News & World Report (back when they actually had a print magazine!! 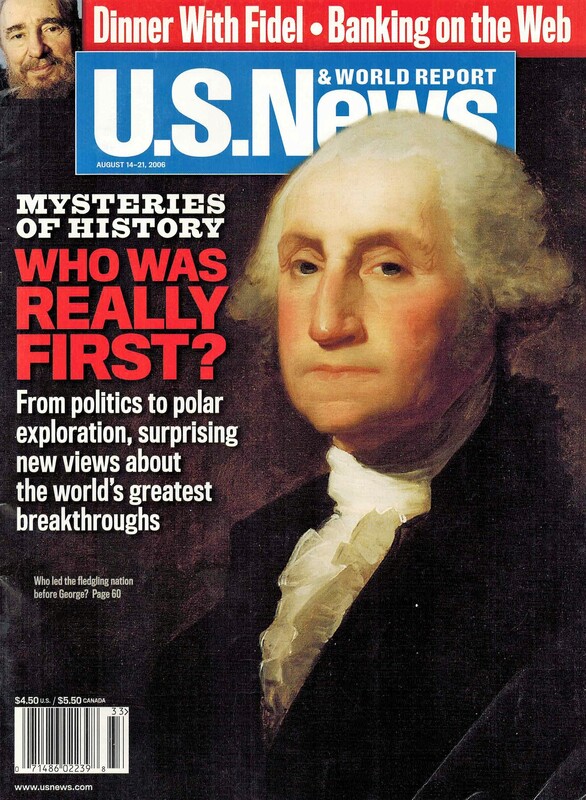 ), I worked in the Features department and we were putting together a package on history’s famous firsts. 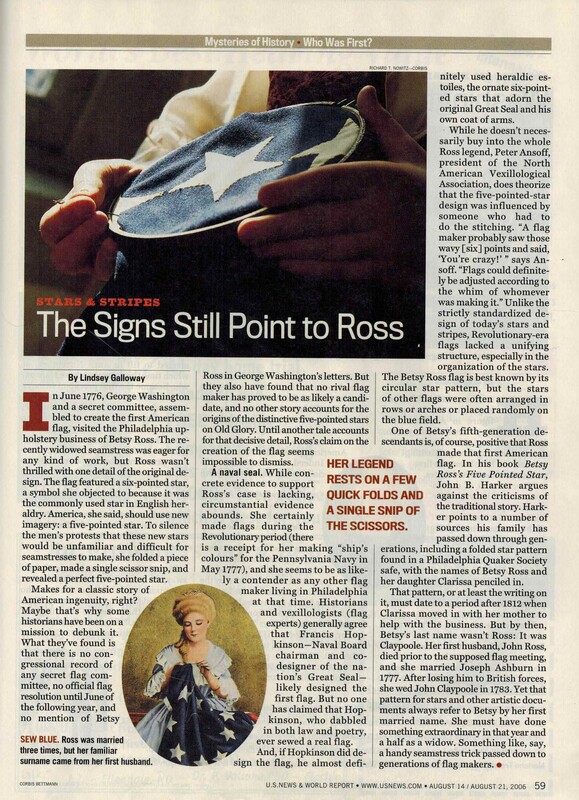 Betsy Ross had seen some tough times in the 1990s, with a single Wall St. Journal article discrediting her story as something entirely made up by her grandson. It was already tough enough out there to find something resembling a female founding… person… and now Betsy was out of the picture? I was eager to dive in and see what held up, and what didn’t. History being what it is doesn’t always leave a paper trail… but in this case, it was a five-pointed star pattern that led me to still believe in Betsy. Since US News has purged most of its archive, here’s the story in its entirety. In June 1776, George Washington and a secret committee, assembled to create the first American flag, visited the Philadelphia upholstry business of Betsy Ross. The recently widowed seamstress was eager for any kind of work, but Ross wasn’t thrilled with on detail of the original design. The flag featured a six-pointed star, a symbol she objected to because it was the commonly used star in English heraldry. American, she said, should use new imagery: a five-pointed star. To silence the men’s protest that these new stars would be unfamiliar and dificult for a seamstress to make, she folded a piece of paper, made a single scissor snip, and revealed a perfect five-pointed star. Makes for a classic story of American ingenuity, right? Maybe that’s why some histroians have been on a mission to debunk it. What they’ve found is that there is no congressional record of any secret flag committe, no official flag resolution until June of the folowing year, and no mention of Betsy Ross in George Washington’s letters. But they also have found that no rival flag maker has proved to be as likely a canddiate, and no other story accounts for the originals of the distinctive five-pointed stars on Old Glory. Until another tale accounts for that decisive detail, Ross’s claim on the creation of the flag seems impossible to dismiss. A navel seal. While concrete evidence to support Ross’s case is lacking, circumstantial evidence abounds. She certainly made flags during the Revolutionary period (there is a reciept for her making “ship’s colours’ for the Pennsylvania Navy in May 1777) and she seems to be as likely a contender as any other flag maker living in Philadelphia at that time. Historians and vexillologists (flag experts) generally agree that Francis Hopkinson–Navel Board chairman and co-designer of the nation’s Great Seal–likely designed the first flag. But no one has claimed that Hopkinson, who dabbled in both law and poetry, ever sewed a real flag. And if Hopkinson did design the flag, he almost definitely used heraldic estoiles, the ornate six-pointed stars that adorn the original Great Seal and his own coat of arms. Unlike the strictly standardized design of today’s stars and stripes, Revolutionary-era flags lacked a unifying structure, especially in the organization of the stars. The Betsy Ross flag is best known by its circular star pattern, but the stars of other flags were often arranged in rows or arches or placed randomly on the blue field. One of Betsy’s fifth-generation decedents is, of course, positive that Ross made that first American flag. In his book, Betsy Ross’s Five-Pointed Star, John B. Harker argues against the criticisms of the traditional story. Harker points to a number of sources his family has passed down through generations, including a folded star pattern found in a Philadelphia Quarker Society safe, with the names of Betsy Ross and her daughter Clarissa penciled in. That pattern, or at the least the writing on it, must date to a period after 1812 when Clarissa moved in with her mother to help with the business. But by then, Betsy’s last name wasn’t Ross: It was Claypoole. Her first husband, John Ross, died prior to the supposed flag meeting, and she married Joseph Ashburn in 1777. After losing him to British forces, she wed John Claypoole in 1783. Yet that pattern for stars and other artistic documents always refer to Betsy by her first married name. She must have done something extraordinary in that year and a half as a window. Something like, say, a handy seamstress trick passed down to generations of flag makers.